Spartan Games has several really great deals going on over in their webshop. For starters, all of their rulebooks are at least half-off. Sure, you can download them for free from their website, but some people like to actually have a book in their hand (I'm included in this count), and Spartan's making it a lot cheaper for you to do so. 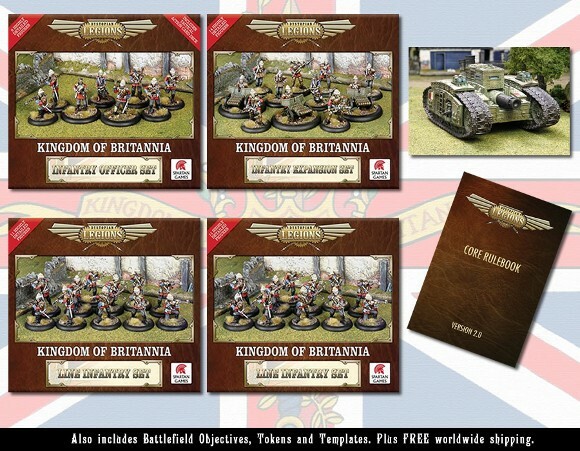 The other deal is for Dystopian Legions army bundles. If you're looking to get either Prussians or English, now's the time. You get several box sets, the rulebook, tokens, and templates, plus free shipping for one, low price. These deals last throughout the month of April. Spartan Games has some new fleets up for Uncharted Seas and they're having a pretty nice sale for them going on now over on their website. 40% OFF NEW Imperial Humans and The Ralgard Fleets! This week we bring you exciting new Uncharted Seas Battle Fleets for the majestic Imperial Humans and the fearsome warrior race The Ralgard. The Vaka Family are born warriors. With a longstanding tradition of martial prowess and a tendency to judge greatness by victory in battle, they have always preferred war to diplomacy. A highly accomplished member of the Vaka family, Grimmulf Eyforr is one of the most ruthless Fleet Commanders to ever sail the Uncharted Seas. Spartan Games shows off some new concept art for their Sky Pirates for Uncharted Seas. 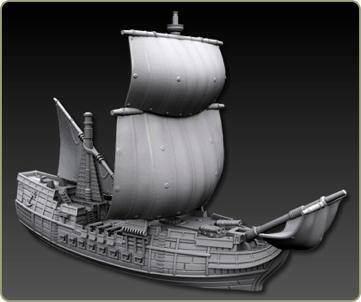 As Uncharted Seas continues to grow and develop we are very excited to show you the latest models – a deadly naval force to accompany the stunning airships of The Sky Pirates. Driven forward by billowing sails, these elegant vessels are the scourge of the Uncharted Seas – their grace belied by their hull rending firepower and vicious boarding parties. Spartan Games has announced that they'll be discontinuing distribution of their Uncharted Seas game line. When Spartan Games entered the wargaming market in mid-2008, we launched with our Uncharted Seas fantasy naval game. We were a very small company then: we didn’t have any offices and we didn’t even cast the models ourselves, but we felt that Uncharted Seas breathed new life into naval wargaming and we were proud of it. Spartan Games has another of their rulebooks for free to download from their website. This time it's Uncharted Seas. They're also having a sale on their Uncharted Seas line. 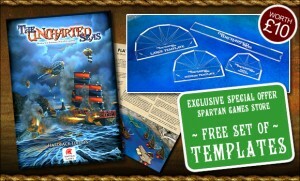 For the first time, Spartan Games has made the Uncharted Seas Rulebook FREE for anyone to download from our website. Set in an exciting and deadly fantasy realm, the Uncharted Seas is a fast paced naval game that delivers plenty of fun as you game with our stunningly detailed miniatures. With well over 100 different Uncharted Seas products spread across 9 fearsome races, there is so much to choose from. Starter Fleets, Upgrade Blisters, Game Cards, Scenery, Monsters... place an order for anything Uncharted Seas and we will give you 30% OFF. Please note that Uncharted Seas Mega Bundles are not included in this promotion. Spartan Games now has all their September releases available and on their way to a store near you. What a release we have for you this month! With more upgrades for the mighty Russian Coalition, the first Dystopian Wars Alliance Nation models, the introduction of two new members of the Kurak Alliance and the first Firestorm Armada Campaign Guide, September is certainly an exciting month for Spartan Games. The September releases will also be shipping from the Spartan Games Online Store from next week, and you can place your orders today! Spartan Games has a lot going in this update. They've got a deal where if you buy 50gbp of Uncharted Seas stuff from their webstore, you get the hardback rulebook and turning templates free. Next is a contest to make them laugh by applying a caption to a Dystopian Wars picture to win the painted bust of Commodore Petrovich. Finally, they've added Firestorm Armada to their parts service. Spartan Games gives us a look of what they've got coming out for August for Dystopian Wars, Firestorm Armada and Uncharted Seas. They're also available for pre-order. It's another explosive month for Spartan Games as new releases populate all three of our action-packed games. The 'Rolling Thunder' continues its momentum as a whole host of captivating new ships for the Russian Coalition are introduced. The war in the Storm Zone intensifies as the first Firestorm Armada Campaign Guide, Marauders of the Rift, hits stores. Finally, the Uncharted Seas sees the release of a spectacular new ship for the Imperial Humans and two hugely-impressive fortifications. These models will be shipping from August 29th 2012. From today, you can place your advance orders in our Online Store to ensure you do not miss out on these exciting new models. Spartan Games is eagerly awaiting the release of the hardback edition of their Uncharted Seas rulebook. To get you to order direct form them, they're offering a free set of turning templates with your order. Check it out. To celebrate the launch of the fantastic Uncharted Seas Hardback Edition Master Rulebook, we are pleased to offer our customers a very special deal. Those who order the Uncharted Seas Hardback Edition Master Rulebook in the Spartan Games Online Store will also receive a set of superb Uncharted Seas Turning Templates, worth £10.00, absolutely free. These highly sought-after templates cannot be found anywhere else and are only available while stocks last. And if you have already placed your advance order there is no need to worry: the templates will still be coming your way. It's our way of saying thank you for choosing to venture into our frantic fantasy realm. The Dwarven Masters of Engineering who designed this vessel were clearly looking forward to the future. Sleek and fast, the submersible glides through the waters of the Uncharted Seas looking for prey. When an enemy ship is spotted the submersible closes in and rises, exposing its potent Magma Guns. When this little beauty hits an enemy model it certainly lets itself be felt. The submarine lowers itself in the water, not quite submerged, and a ram rises up out of the water that is slammed into the hull/body of a model. The engine room of this vessel gets called upon to give it 150% when a ram is about to take place. The dwarves are expected to generate a sudden burst of speed that allows the model to slam into an enemy model with all of its might, ripping a giant hole in it. The Twilight was the first Heavy Cruiser deployed by the Dragon Lords in the waters of the Uncharted Seas, and is in effect an up-gunned variant of the Shadow Class Cruiser. One of the key additions to the vessel is a potent fore cannon, and a squadron of four Twilights can hit an enemy hard. This large submarine was designed by the Shroud Mage engineers with one purpose: tabletop intimidation. Its massive cutting blades are designed to slam into the hulls of enemy ships, ripping their bottoms wide open and sinking them in the blink of an eye. The first Destroyer to be used by the Shroud Mages, the Adept is an all round capable machine of war. Its fore and broadside weapons are effective, but the addition of a turret gives it the ability search the horizon for prey. Designed to give enemy vessels a true body blow, the Prowler Battleship epitomises the Orc way of life: nasty. Orc commanders will aim the Prowler at an enemy fleet and sail straight down its throat, a massive array of cannons to the fore smashing hulls and crews, a Red Ram rating of 9 ready to crush a hull if the ship hits a target and a crew rating of 12 ready to pour onboard a ship, wiping its crew out. If you have a Battleship design that works well, why not take it and copy it? That is clearly what the Orcs thought when they built the Ravager Cruiser. Fore weapons slam into an enemy, and a full squadron of Ravagers can hand out a high level of pain, with large crews ready to board and capture enemy ships. One of the deadliest Cruisers in the Uncharted Seas. The elves have poured elegance, grace and deadliness into the design that is the Phoenix. Don't be taken in too much by its sleek curves though; this is a hardened war machine, capable of engaging and destroying enemy vessels with ease. Fast, nimble and sleek: three words that perfectly sum up the ship that is the Raven Frigate. Spartan Games have posted images and pricing for the Second wave of releases for their relaunch of the Uncharted Seas fantasy naval combat game. Like a dagger in the hands of a skilled assassin a Thaniras Elves Starter Fleet is ideal for players looking to stab at their enemy, carefully removing threats from the gaming table and striking at the heart of the opposing fleet. The stylised design of the Elves makes them elegant to look at, but at the same time they carry a hint of danger. In the hands of the right player any opponent will be crushed by this fleet. 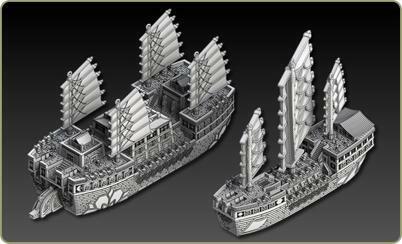 Spartan Games has previewed new 3D renders for Dystopian Wars and Uncharted Seas. The dull pulsing engines of the Gewitterwolke Class Airship are often heard, but rarely do you see this airship emerge from the stormy skies until it is too late. With a crackling, thunderous shriek the Fore Tesla Coil unleashes hurt on any unfortunate enemy foolish enough to stray into the path of this aerial Armageddon. You may also want to reconsider your position should you be ill-fated enough to be darkened by its shadow; the arsenal of bombs this flyer carries ensure it leaves little standing in its wake. Spartan Games continues to post images and pricing for the first wave of releases for their relaunch of Uncharted Seas fantasy naval combat game. 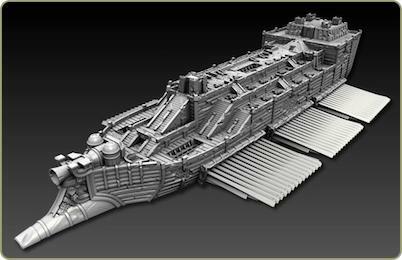 Spartan Games have posted images of the 3D sculpts for the Orc Raiders - Warcroc Class Frigate and the Thaniras Elves - Crow Class Destroyer. Spartan Games have posted images and pricing for the first wave of releases for their relaunch of the Uncharted Seas fantasy naval combat game. Spartan Games is proud and excited to be going back to where it all started a little over 3 years ago: Uncharted Seas. As we announced in July, Uncharted Seas is being given an overhaul and now we can show you what our design team have been up to. Since we announced the re-launch the roll-out plan has changed slightly. The Uncharted Seas range has grown in 3 years and so instead of re-launching everything together we’ve decided to split it into 4 phases to make it more manageable. There will be 2 weeks between each phase. The Nightmare Class Flagship is the terror of the high seas, a mighty floating fortress full of undead warriors. The centre piece of its construction is a temple dedicated to the Bone Griffons revered totem, the Abyssal Griffon. Enemies of the Bone Griffons quake in fear at the appearance of such temple ships, because the dreaded influence of their priests’ magical aura can be felt at a great distance. There are many ships across the Uncharted Seas that strike fear into the hearts of fleet admirals when they are seen on the horizon. There is a special curse among the Orc Raider clans for Imperial Human martyr vessels who rob hard won victories from even their fiercest captains. Dwarven engineers spit at assignment to piston ram cruisers, for their precision engineering requires endless maintenance in sweltering and dangerous conditions. There are ships which are known for good luck and safe travel and there are ships cursed for everything under the sun, but there are some reputations that go beyond simple hatred. 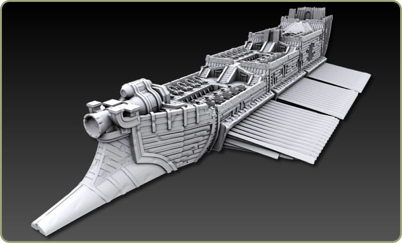 Spartan Games have posted previews of the 3D sculpts for three upcoming Uncharted Seas vessels - the Imperial Human Hawk Cruiser, the Bone Griffon Sea Wraith Class Cruiser and the Shroud Mage Enigma Class Flagship. 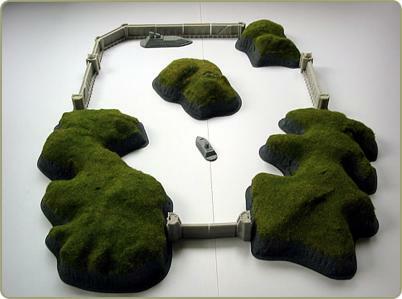 The Spartan Games website has information, and photos, of a new set of plastic injection moulded island terrain pieces from Amera Plastic Mouldings.